For a touch of elegance and beauty in your home, shop or office, turn to the finest stonemasons in Victoria. Regal Stonemason is the industry leader specialising in the manufacture and installation of kitchen benchtops, vanity tops, splashbacks, bbqs, fireplaces, reception countertops and more. A sophisticated, timeless addition to any home, natural, neolith, dekton and engineered stone benchtops are built to last with high durability and low maintenance requirements. For your peace of mind, you can have confidence in knowing that all our products are the result of impeccable craftsmanship and are fitted with precision at the lowest possible price. Select from a wide range of colours to suit your home’s colour scheme and décor, each with their own merits and style. 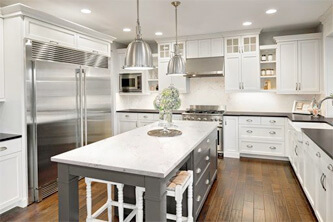 Also known as engineered stone, leading companies such as Caesarstone, Quantum Quartz and Essastone create blends of quartz with a small amount of a specialised compound to create striking non-porous engineered stone with extreme durability that will resist moisture and last a lifetime with proper care. While natural stones need re-sealing to help protect the surface from liquids, they are often chosen for their remarkable beauty and variety of unique patterns. Granite and marble are popular choices for their signature appearance that adds timeless class to any kitchen or bathroom, no matter the style! There are several different profiles you can choose from – while a stone slab is 20mm thick, edges can be extended to 40mm if desired. By using mitred edges, we can also make edges 60mm, 80mm, or any other thickness that you may require. While we ensure that all our products are of the highest quality, we also endeavour to provide you with the best possible customer experience. We’ll work with you from start to finish, discussing your goals and achieving them quickly and precisely. As a team of highly skilled craftsmen, we hold ourselves to the highest standard when it comes to our work, and will not be satisfied until we have accomplished exactly what you need. Don’t trust a business that will take short cuts – choose the experts that will efficiently deliver and install engineered or natural stone kitchen benchtops to an unrivalled standard in Melbourne. 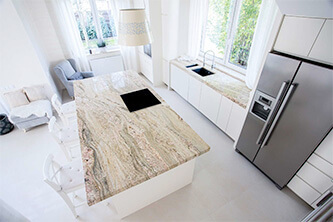 For more information on getting a granite, marble or engineered stone benchtop for your domestic or commercial property in Melbourne or across Victoria, contact us online or call (03) 9580 8990 for a FREE quote today. Select from a wide range of stone colours to suit your home’s colour scheme and décor, each with their own merits and style. 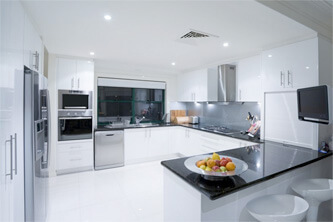 Also known as engineered stone, leading companies such as Caesarstone, Quantum Quartz and Essastone create blends of quartz with a small amount of a specialised compound to create striking non-porous stone overlay benchtops with extreme durability that will resist moisture and last a lifetime with proper care. “I would like to thank the Regal Stonemason team.The team offer exceptional customer service and are amazing at their job. I can’t wail for the finished product to be installed. I would be more than happy to recommend this company to all of my family and friends – Thanks Regal Stonemason.